Definition at line 27 of file msg.c. Definition at line 26 of file msg.c. Definition at line 542 of file msg.c. Referenced by test_data_msg_encoding(), test_decode_msg_update(), and test_hash_msg_encoding(). Definition at line 288 of file msg.c. Referenced by test_data_msg_encoding(), test_decode_msg_get_param(), test_enveloped_msg_encoding(), test_hash_msg_encoding(), and test_signed_msg_encoding(). Definition at line 602 of file msg.c. Definition at line 2679 of file msg.c. Definition at line 2661 of file msg.c. Definition at line 3602 of file msg.c. Definition at line 625 of file msg.c. Definition at line 41 of file msg.c. Definition at line 360 of file msg.c. 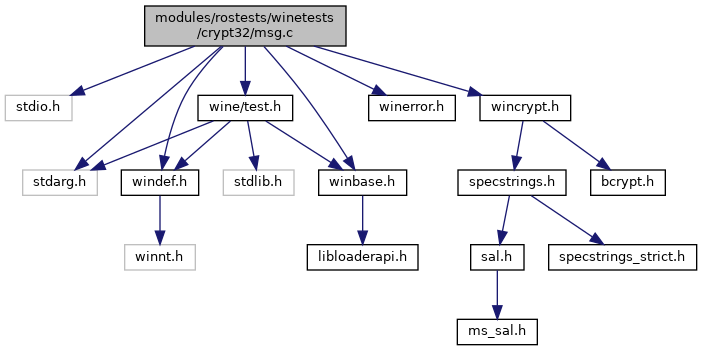 Referenced by test_data_msg_get_param(), test_data_msg_update(), test_decode_msg_update(), test_enveloped_msg_update(), test_hash_msg_get_param(), test_hash_msg_open(), and test_hash_msg_update(). Definition at line 3761 of file msg.c. Definition at line 715 of file msg.c. Definition at line 636 of file msg.c. Definition at line 480 of file msg.c. 498 * and the type isn't available. Definition at line 315 of file msg.c. 350 * able to use anything but szOID_RSA_data when streaming is being used. Definition at line 368 of file msg.c. 428 /* Doesn't appear to be able to update CMSG-DATA with non-final updates. 430 * GetLastError() == 0, so it's not worth checking there. 468 * exceeds the size specified in the stream info. Definition at line 3188 of file msg.c. Definition at line 2854 of file msg.c. 2896 * even though there's only one hash. 3046 * and value of the key id. Definition at line 2313 of file msg.c. 2447 * with unspecified type..
2493 * fails with unspecified type..
2553 * hash value succeeds.. Definition at line 2277 of file msg.c. Definition at line 2254 of file msg.c. Definition at line 2053 of file msg.c. Definition at line 2120 of file msg.c. Definition at line 1060 of file msg.c. Definition at line 966 of file msg.c. 1029 * call the output function. Definition at line 820 of file msg.c. Definition at line 723 of file msg.c. Definition at line 755 of file msg.c. Definition at line 270 of file msg.c. Definition at line 3205 of file msg.c.